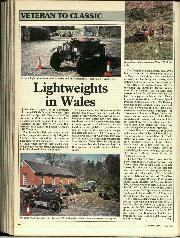 The VSCC Light Car & Edwardian annual Welsh Driving Tests and Trial were held on April 8-9. Two miracles! 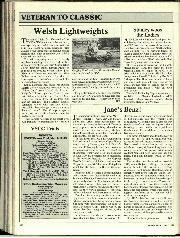 One, the way the VSCC commands the weather: atrocious all week, delightful for the event. Secondly, at least two "new" cars, Ron Barker's 1928 Lafitte and Chris Gordon's 1919 Tamplin. The former is a light car of such extraordinary ingenuity that it is truly fitting that "Steady" Barker should be the person to have restored and campaigned it. The kind of thing which only an inebriated person staggering along the Strand clutching £100 in his hand would have bought new. To operate the variable friction-transmission the 736cc three-cylinder air-cooled radial engine actually pivots, while leaving its carburettor in situ. Direct-drive top gear, a foot-brake that tilts the engine further, until it rubs against a friction-pad on the bulkhead, a tiny pedal that provides extra grip in times of dire emergency, simple coil-spring ifs and 700 x 80 tyres feature on this odd two-seater, of which some four have survived around the world. Barker claimed to have used two Sunday Times for relining the drive on route but the Lafitte survived the DTs without the dreaded aroma of burnt paper! 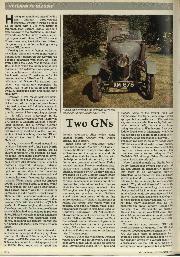 The Tamplin had lain dormant since 1926, but it too survived the driving tests, on its 26 x 21/2 tyres, with nothing worse than a loose exhaust-joint, but, being sans reverse, three stalwart pushers were needed as a substitute. An entry of 64 embraced some 20 A7s, including the outwardly-identical Chummies of the Gledhills, and six GNs. 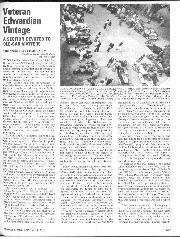 Nonstarters included Barry Clarke whose FN-GN had timing-gear problems and Wendy Cooksey's Morris Minor, with a run big-end. 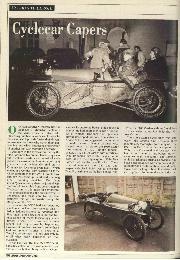 President Collings was on his 1904 Darracq, Rosoman had foresaken A7 box for open 9/20 Humber, Dowell was in a vast 24hp open screen-less wooden-winged Sunbeam, Jim Thompson had an early Singer Junior two-seater that had spent much of its life in Australia and if anyone had been imbibing, the sight of two vee-twin Edwardian Rileys would have been disturbing! Sudjic was two-stroking effectively in the tiny Aero. It is invidious to try to report DTs or trials and one day I shall be lynched for criticising competitors from the sidelines. 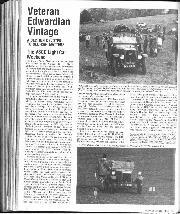 So I will refrain from saying how they got on up a short, slippery section in "Lord Gibson-Watt's estate, or at two steep hills in a scrambling course in the heights above the Elan Valley, where even getting to the start of Hill Six was difficult, instead letting the results tell the story.